Our Bed & Breakfast is near Aracena, Seville, Andalucia, Spain in the Sierra de Aracena National Park. Set amongst a chestnut and cork-oak forest we operate as a family B&B and self-catering holiday cottages. We run cookery courses, photography courses, creative writing retreats and fitness retreats. Hiking trails and stunning views. Aracena is our charming local market town and it's a centre for activities such as bike rental (mountain bike hire, or e-bike hire which is the latest addition to the possibilities for exploring and exercise.) You can rent your e-bike with built-in GPS technology which offers you guided routes or you can just take off on one of the local trails. We also have various riding stables in the vicinity, where you may take horses out on a local route with a guide. In town, you will find sports facilities such as the Paddle-Tennis courts, Tennis courts, and a heated indoor swimming pool which is great on winter days. The walking in the Sierra is wonderful with many trails linking the small villages of the Sierra de Aracena. Finca Buenvino B&B is located just outside the beautiful town of Aracena in Andalucia (Huelva province) in south-west Spain, very close to Spain's border with Portugal. Aracena shares its name with the nature park in which it lies. With a fantastic array of flora and fauna, and a cooler mountain temperature, it is ideal for walkers. Aracena town itself also boasts plentiful attractions, shops and restaurants, including the famous Grutas de las Maravillas caves, an undergound wonderland of stalactites and lakes, beautifully illuminated. You can also visit the Cabildo Viejo where there is an exhibition on the nature reserve (Sierra de Aracena y Picos de Aroche) in which we live. The reserve was formed in 1989 by the Andalucian government in order to preserve the countryside, villages and way of life of this unique area. Hills, thickly wooded with sweet chestnut and cork oak, give way to small groves of olives or walnuts and orchards of apples, plums, peaches and figs. Wild, rocky escarpments are covered in cistus and heather. Stone-walled mule tracks meander from village to hamlet and are perfect for walking or riding. In Spring, the wild flowers carpet the meadows and clumps of peonies grow in the shade of the chestnut trees. Whitewashed villages with cobbled streets hang from the side of a hill or nestle in a valley. In autumn, chestnut pickers fill their baskets in the woods, as mules stand patiently to be loaded with sacks for the return journey to the village. The nature reserve itself has Egyptian Mongoose, Badgers, Red deer, Foxes, Genet cat, Moufflon and wild boar. Not all easy to see, but sometimes as you sit quietly sipping a sundowner in the depths of the woods you might catch a glimpse of a mongoose coming down to drink, or perhaps the blue flash of a kingfisher's wing. Aracena (Pop:7500) is the capital of the region and gives its name to the mountain range in which it lies and to the Natural Park which surrounds it; one of the most important protected areas of the Community of Andalucia. The city centre, has many monuments of cultural interest. Crowning the hill are the ancient castle and the Church of Our Lady of Sorrows, which preserves the Almohad tower, once the minaret of the mosque that preceded it. The Christian conquest which drove out the Moors, was carried out by the Portuguese King Sancho II at the beginning of the thirteenth century, who sought to annex the region as the High Sierra of the Algarve, but the intervention of the Castilian King Ferdinand III and his son Alfonso X made Aracena part of the kingdom of Seville in 1255. The area remained sparsely populated until the end of the thirteenth century, when King Sancho IV began to bring in settlers from Leon, Asturias and Galicia, and reinstated the fortress on the hill, in order to defend the area from the neighboring kingdom of Portugal. Its defence was entrusted to the order of Santiago. Repopulation was not an immediate success. It was not until the 15th century that a true settlement of the area was achieved, the demographic crisis having been caused by the epidemics of the previous century as well as frequent conflicts with Portugal. During the Middle Ages, the town, which originally huddled around the castle for safety, continued its expansion down the hillside towards the valley. The grandiose project of the Parish Church started to be built in 1478, but was never completed in its entirety. Even so it remains impressive; although it was torched during the civil war, and many of the works of art were destroyed, a new roof was added a few years ago and the church has regained some of its former glory. 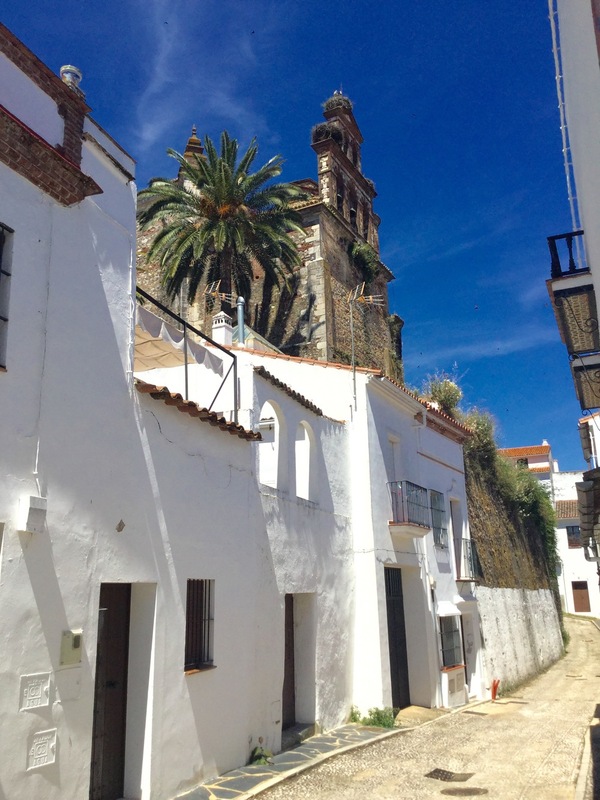 In the late nineteenth and early twentieth centuries the town grew with renewed momentum and structures such as the Town Hall of Santa Catalina, the Casino de Arias Montano and the Market Square added to the wealth of interesting buildings. The discovery in 1886 of the Cave of Wonders, which opened for visitors in 1914, coupled with the softness of the summer temperatures, made the town the favourite holiday retreat of the Spanish royal family. Aracena gradually turned into a centre for country tourism, where the pace is slower than in the cities, and the air is pure. The caves are well worth a visit. They are some of the biggest and the most beautiful in Western Europe. Said to have been discovered by a swineherd, searching for a lost pig (or in some versions a shepherd searching for a lamb! ), the cave complex was first opened for tourists in 1914, after the Marques de Aracena had installed the first simple electric lighting system. The caves lie deep inside the hill on which the castle church is built and where the ruins of the old fortress are to be found. The beauty of its lakes, the spaciousness of its cathedral-like chambers and the marvelous colours of its wide variety of stalactites and stalagmites, form something altogether singular, which deserves the name 'Las Grutas de las Maravillas'. As the brochure says “Water has written a poem through the silence and slowness of the centuries." The names of the individual chambers, although they might sound absurd, are an accurate reflection of the rock formations found inside: 'The Cathedral', 'The Sultana's Bath Chamber', 'The Emerald Room', 'Godʼs Crystal Room', 'The Submerged City', 'The Enchanted Tannery', 'The Chickpea Room', 'The Gallery of Nudes'.